The finals were held in the 63rd edition of the Bocskai Memorial Tournament in Debrecen, Hungary where strong Asian teams attended in the competition. Chinese Taipei’s AIBA Women’s World Champion Chen Nien Chin, and Kazakhstan’s new sensations such as Saken Bibossynov, Serik Temirzhanov and Tursynbai Kulakhmet won the gold medals among the Asian boxers. The Best Boxer Trophy of the Bocskai Memorial Tournament was taken by Kazakhstan’s 20-year-old Serik Temirzhanov in Debrecen. Chinese Taipei’s defending AIBA Women’s World Champion Chen Nien Chin arrived to the Bocskai Memorial Tournament from the Golden Girl Box Cup where she was the Best Boxer of the Event. The 21-year-old Chen dominated her semi-final against Hungary’s Vivien Budai and advanced to the final in Debrecen. Chinese Taipei’s welterweight (69kg) star had to meet for the gold medal of the Bocskai Memorial Tournament with her main rival Russia’s Rio 2016 Olympian Iaroslava Iakushina. Chen used her tricky style and launched shots from each attacking position in the first round and in spite of her difficulties in the second she controlled the third against such competitive rival as the Russian. Kazakhstan’s Saken Bibossynov is only 21 but he is already WSB Team Champion with the Astana Arlans Kazakhstan. The Kazakh southpaw used her longer reach in the first round against Ukraine’s Ihor Sopinskyi who was a surprise in the Bocskai Memorial Tournament. Bibossynov, who is fighting for a top place in the national team, was confident and found his best fighting distance in the second part of the bout which was enough strong performance to capture the gold medal of the men’s flyweight (52kg). Kazakhstan next finalist in the Bocskai Memorial Tournament was Orazbek Assylkulov at the men’s bantamweight (56kg). The 20-year-old Kazakh southpaw talent, who claimed silver medal in the last edition of the National Championships, eliminated Jordan Rodriguez in the semi-final and he had to face with another boxer from France, Samuel Kistohurry in the final. Assylkulov produced strong performance in the second round but Kistohurry was slightly better than him which means the young Kazakh claimed silver in Debrecen. 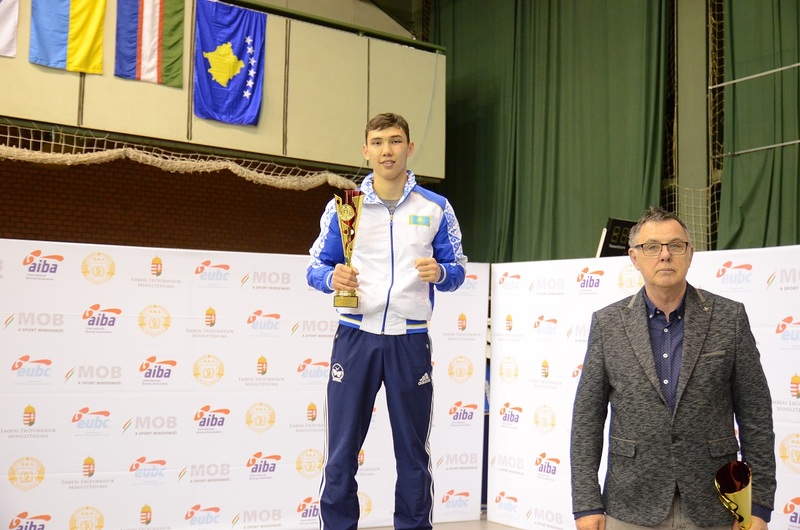 Kazakhstan’s third finalist in the Bocskai Memorial Tournament was Pavlodar 2016 ASBC Asian Youth Champion Serik Temirzhanov at the lightweight (60kg). The Pavlodar-based talent, who trains with coach Azamat Makazhanov, eliminated England’s Callum Thompson in the semi-final and met with Thailand’s Asian Games bronze medallist Rujakran Juntrong in the final. The Kazakh boxer was a hard target for the Thai hope and controlled the first two rounds with his amazing footwork. Juntrong gave in everything in the final rounds but his efforts were not enough to turn back their contest in Debrecen. Iran’s Moslem Maghsoudi is two-time National Champion in his homeland but the Bocskai Memorial Tournament is his first ever competition out of his country. The 23-year-old light welterweight (64kg) boxer defeated strong European rivals such as Hungary’s Hamburg 2017 AIBA World Boxing Championships competitor Richard Kovacs and Moldova’s Mihail Cvasiuc but he was defeated by Poland’s Mateusz Polski in the final. Kazakhstan’s former Youth National Champion Tursynbai Kulakhmet won the title of the Strandja Memorial Tournament in 2017 already which is Europe’s most difficult competition. The 24-year-old boxer is a strong middleweight (75kg) hope who dominated his semi-final against Argentina’s Francisco Daniel Veron. The Kazakh boxer was a hard target for Poland’s Bartosz Golebiewski and dominated the opening minutes of their final. Kulakhmet was in different level than his European rival and claimed Kazakhstan’s next gold medal in the Bocskai Memorial Tournament.